The Pope has vestments for liturgical use, like the bishop’s mitre. He also has another wardrobe for state functions, including his short cape, the mozetta, which is an abbreviated robe of state. This was revived by Benedict XVI. The winter version is red velvet, edged with fur, and comes with a matching cap. Pius IX, despite being ousted from the Papal States, insisted to the end that he was still the King of Rome, and he is buried in this vestige of a royal robe. When it comes to papal trips, the pope gets the best of both worlds. He claims the diplomatic perks of a head of state  yet as a religious leader he doesn’t hesitate to make politically-charged statements about the policies of his hosts  which no real visiting head of state could get away with. “In order for this arrangement to work in any country that has separation of church and state, the papacy must be recognised as both a religious and political organisation.”  Then, like any other head of state, the pope gets his trip paid for by the host country, including his travel expenses, his room and board and his huge security bill. A poll taken on the eve of the visit of Francis I In 2013 shows why Brazil was a papal priority. In the six years since his predecessor's trip (see below), the number of Brazilians calling themselves Catholic country sank from 64% to 57%. Furthermore, only 5% of these self-professed Catholics said that they voted for the politicians recommended by their Church. And it's not just the laity who have been abandoning the Church. It's estimated that one in four Brazilian priests have left in order to marry. The Brazilians were obviously in need of another papal visit. 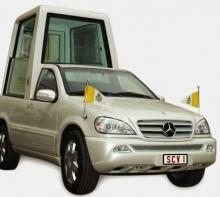 Two popemobiles are generally shipped abroad by air cargo before each papal trip. These are modified Mercedes-Benz M-Class off-road vehicles, rugged, powerful and four tons apiece. The Pope sits in a high seat in the back within a cube made of advanced, bulletproof plastic. Shortly before the 2010 papal tour of Malta in his armoured vehicle, a Maltese enquired if anyone could lend the Pope a donkey so that he could use the same transport as Jesus did. However, the arrival of St. Paul, which this event commemorates, was somewhat different. His ship struck a reef, the hull broke up and the Saint swam ashore. That apostolic visit was accomplished at no cost to the Maltese taxpayers. A Vatican expert who has studied the impact of papal trips on public opinion notes the benefits ― if carefully timed. The Pope waited until 2008 to visit the USA, when the reports about priests abusing children were no longer prominent in the media. 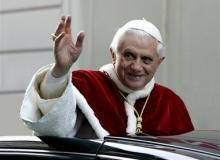 According to the Church poll, 61% said the papal visit had “surpassed their expectations”. Because the host country pays for the trip, this is free publicity for the Vatican. In the wake of news of the tourist shortfall, the financial shortfall was made public when the Auditor General was finally allowed to release his “top secret” report. According to this, the Australian taxpayers will have to pay an additional $100 million AUD. He said that “the estimated final cost for World Youth Day is six times the original budget estimate.” His report says the actual outlays are likely to be $120 million, but that figure would not include a host of costs incurred by other Government agencies, and so the true cost of hosting the event may never be known. For an assessment of the attendance and financial figures see Max Wallace, “World Youth Day wash up”, Online Opinion, 5 February 2009. ♦ Two “popemobiles”, each weighing 4 tons, were flown in by military Hercules C-130 transport planes to Paris 10 days in advance so that the police could become proficient in driving them. ♦ In Paris 2000 police formed a network through the capital, the river brigade was mobilised to watch the banks of the Seine, and sharpshooters were posted on high points. 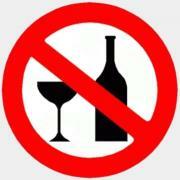 ♦ Glass bottles, large flags, banners, posters or signs were forbidden. ♦ About 72 hours before the pope's arrival in Lourdes, the holy site was “decontaminated” by mine detectors.Company Number One of motorcyclists from France's élite riot police controlled the entrance to the football stadium where the pope would hold the rally. The local airport of Tarbes-Lourdes-Pyrénées was guarded by police, while the hills which overlook the town were patrolled by the mounted brigade. ♦ And finally, Lourdes was blanketed with an aerial security cordon extending for 20 kilometres in all directions, where radar, planes and missiles would be prevented from attacking the pope. What all this security cost the French taxpayers has never been revealed. Nor do we know the true cost to the Brazilian taxpayers of the papal visit estimated at 50 million Brazilian reais  (about 28 million US dollars or 18 million British pounds) ― a trip which the Pope used to urge the signing of a concordat. Naturally the Vatican didn't mention that that Brazil might have been upset by the politically-charged remarks of its expensive guest. On the plane that took him to Brazil, Benedict backed Mexican bishops who threatened to excommunicate Catholic politicians who supported liberalization of Mexico City's abortion law. For the 2006 papal trip the Polish government banned the sale of spirits in the cities visited by the Pope — but not, of course, in the duty-free shops for tourists. Thus in Kraków the only place where you could buy vodka during the Pope's visit was at the John Paul II Airport. Of course, in the end both the Australian and the German taxpayers can afford to subsidise the pope. But unfortunately, papal trips are not confined to lands like these. The much-travelled John Paul II visited 129 different countries, few of them as wealthy as Australia and Germany. It's early afternoon on Monday, September 11, 2006. Armed with a search order and submachine guns, a special commando SWAT team of the Bavarian police swoops down on the Lindner family farm. This hilarious incident illustrates the expensive measures to keep the Pope safe from threats, real or imagined ― and what can happen if you question the costs of his state visit. On 15 December 2004 the European Parliament rejected in its first reading the earmarking of €1,5 million for the funding of “World Youth Day 2005” in Cologne ― but the next year the grant got through. And that doesn't count at least €13.5 million contributed by various German governments.